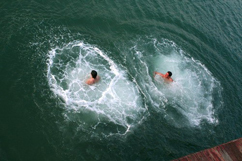 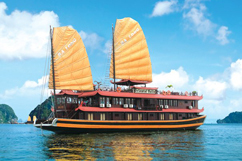 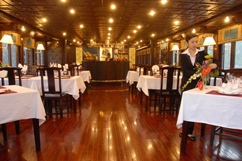 Designed in the concept of Oriental style junk boat, the Oriental Sail is among the good-feedback junks in Halong Bay. 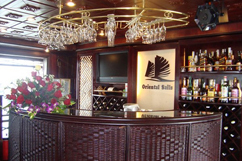 The Oriental Sail features with air-conditioned 16 cabins. 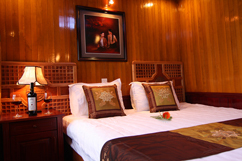 On the first floor (first desk) are 12 cabins and kitchen. 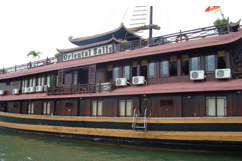 And located on the second floor are 4 cabins with connecting door, restaurant and bars. 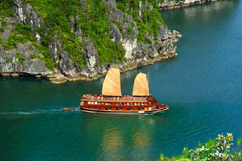 Oriental Sail Cruise is the wonderful way to enjoy Halong Magical Bay. 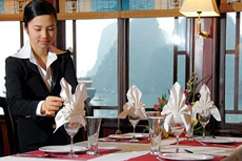 The top desk is equipped with comfortable tanning chairs & the wooden bar is a wonderful place to view Halong majestic Halong Bay. 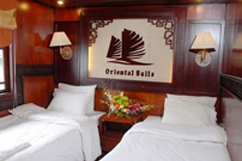 The oriental Sail is 38 meters long from bow to stern and measuring an impressive 8 meters wide, Oriental Sail can accommodate 48 passengers for overnight stay on cruise.